Dakota Plains Auctions kicks off their 2018 year of auctioneering with fantastic New Years Day auction with over 500 items up for bidding. Included are firearms, cowboy collectibles, chaps, saddles, spurs, boots, hats, beadwork and more. There is also a selection of artwork, antique advertising, glassware and furnishings, and many more great antiques for any collector. Dakota Plains also put in a selection of swords and knives, ammo, and some great gold coins. Register early to beat the rush and get in bids as soon as possible. Lot 62 presents a highlighted rifle of the day. This is a Winchester winder musket .22 cal with serial number 130276. This is in nice condition and US flaming bomb marked. The barrel is 80 to 85 % blue drifting to plum, and the receiver is drifting to brown with light vise marks. The sling swivels are intact and it comes with walnut stocks. Opening for bidding at only $400 this is one of the best firearms deals of the day. A stunning Plains Indian soft cradle is up for grabs at Lot 98. This is 32” long and beaded on parfleche with a banded and butterfly pattern. It is in very good condition and there are a pair of photos in the online catalog. Opening for $400, this is estimated in value as high as $1500. 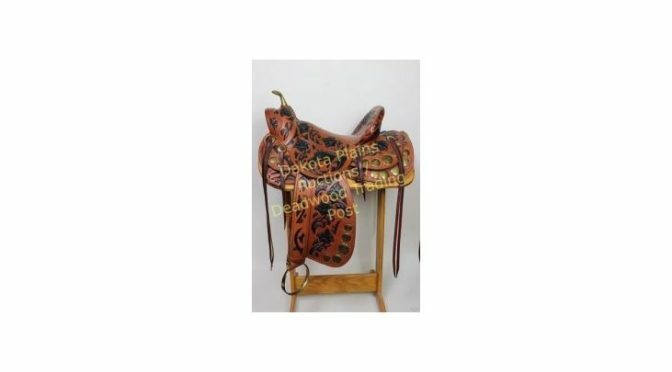 Lot 154 is offering an impressive “El Vaquero” Jerry Croft built saddle from the deceased Deadwood maker (1942 – 2013). This is the first of what was intended to be five, but Jerry only finished this one. The saddle features a 16 inch seat, brass horn and conchos, and iron stirrups. Several photos are available online for inspection of this beautiful creation, and bidding opens at only $600. The auction all begins for live bidding at 10AM Local Time on January 1st, 2018, presented by Dakota Plains Auctions. They will present a live audio and video feed to give the worldwide audience of bidders a great part in the auction day. Absentee bidding is currently available and registrations are open. Dakota Plains Auctions will be happy to answer any questions about the online catalog via telephone or email.